Every home at some point should have a bean bag chair. They can be used for movie nights, reading and pretty much everything you can think of. They are so easily moved around and propped-up that this makes them an ideal companion in every kid’s room. Bean bag chairs are slightly different from the bean bag, however the only difference is a slight-one and that they have a similar shape to a chair, but this is mainly to do with stitching and not any solid internal structure, which some might wonder about, maybe even thinking that it ruins the relaxing comfort of the soft feeling the original type had, but fret not it’s an all-rounder. Disney is known to all kids and is among their favorite movies of all times, especially with Anna and Elsa characters. This is why anything related kids love, which is why this chair is another in this review. This is more suited for a girls bedroom and would be a great present or gift. Material – The material is nylon and is made in the USA. Dimensions – 19 x 18 x 16. Weight 14.5 ounces and is very light weight and can adapt to any space. Capacity – 1 kid is ideal and for ages between 3 and 12 years it is suitable. Safety – Good quality stitching and is very similar to the previous Disney themed bag in this review, which is designed to be child-friendly use. Color – turquoise with a slight purple lining that is seemed into the stitch. 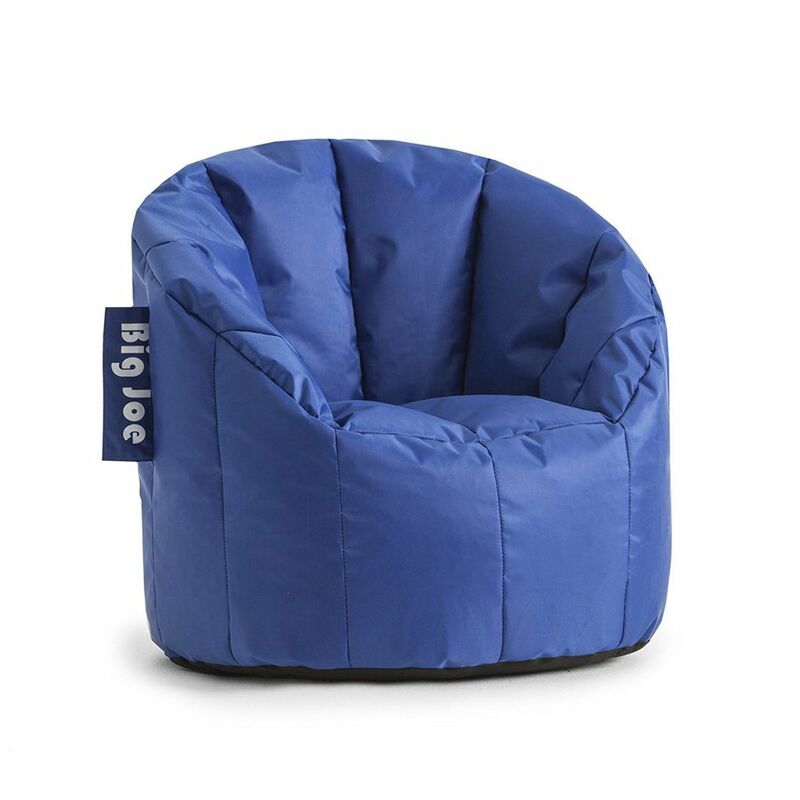 This is a great USA made product and comes in loads of different colors, it is super-comfy and great for lounging around the house or put into the children’s room, which can’t accommodate anything too big, which makes this ideal. Material – Micro suede and the micro-style beads are a mix of memory foam that are the equivalent to a sofa. This bag is double stitched and made to last the test of time, so your kids do not break the fabric easily. Dimensions – 20 h x 24 w x 24 d in inches and is a good size for kids of all sizes. Capacity – 1 or 2 kids, but ideally 1 for comfort, unless they don’t mind a cuddle. Safety – The durable nature of these make them really safe to use. The lining of this has a zipper on the inside to prevent the possible exposure and limits the likelihood of a hazard. Washable – This comes with an inner lining and makes washing this very easy, just simply remove then pop in the wash and dry and then pop back on the internal liner. Ideally use cold water and dry slowly without too much extreme drying techniques. Color – There are loads of colors to choose from and finding one that suits your kids room or your living room will be easy enough. 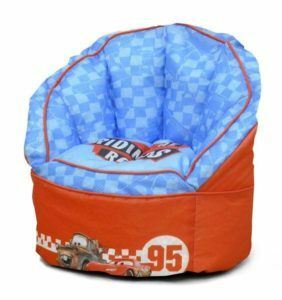 This is a cool kids racing Disney themed chair, which is a perfect gift for them to enjoy and if your kid likes the movie then this is ideal. Material – The material is 100% nylon and made in the USA. Capacity – 1 – 2 kids, but ideally 1 is better because of the dimensions. Safety – This chair is ideal for children from 3 – 12 years and is designed for kids. Color – Blue and Red with a car images. This is a little less versatile and is not as well made as the other “Chill Bag”, which in comparison is better, but the theme is a cute feature and is a PRO of why I added this in the review. 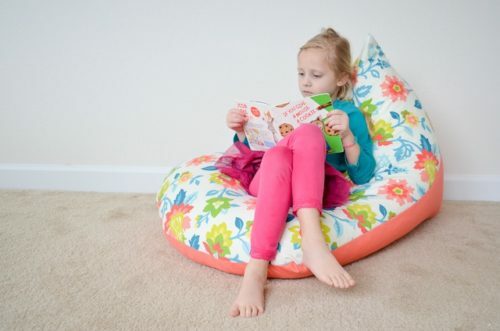 This huge bean bag chair is for those kids who wanna chill out both adults and children of all sizes can use this bag. Material – This is made with polystyrene and a bean filling. Made in the USA and is extremely high quality. 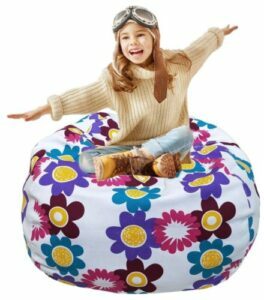 Shredding foam and a quality made zipper makes this a good choice for kids who are going to be rough with handling the bean bag. This bag has been double stiched. 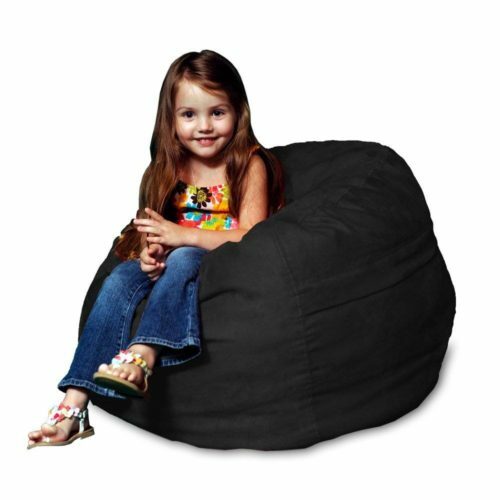 Dimensions – 48 x 48 x 30 Inches and is the largest bean bag chair for kids of all sizes and weights. Capacity – This can sit 2 larger children, if they don’t mind huddling up watching a movie. Safety – Designed for all ages and children of different age and sizes. The double locking feature makes the zipper able to secure the inside filling. Washable – Yes, this bag can be washed in the washing machine. Color – Green, but also comes in different colors. Big-Joe is a great company and produces all shapes and sizes. This particular bag is larger than most of the previous in this review and if your kid is slightly larger then this might be the one to go for. Material – SmartMax material and is unique in this review with the only on so far having a water-resistant feature, which can handle rough play and is made to last. Dimensions – 35 × 35 × 32 and weighs 11 pounds and is slightly heavier, but with such a larger capacity this can be used for 2 small kids. Capacity – 1 kid at a time. Safety – Double stitched and has a strength embedded into the zipper which is also double. Color – Blue, but comes in all colors. This is a superior product and offers the best quality so far, but is slightly more expensive than the rest, which can be noted as the main difference. This cute pink one is great for girls wanting to invite their friends over and hang-out and play together. 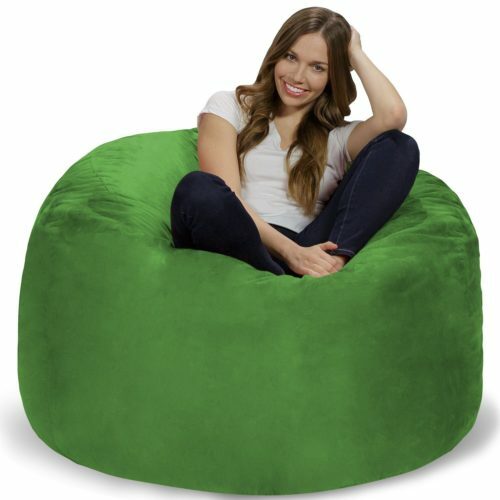 This is light weight bean bag and makes for easy use and extremely function-able. Material – Cotton-twill, which is really light weight upholstery. Dimensions – 31 x 31 x 31 inches and the weight is 8 pounds. Safety – Designed for general use, but not as sturdy a design in comparison to the “Big Joe” bag with the double stitching and double zipped features, which lessons the likelihood of a break or rupture in the fabric and therefore decreases risk of a hazard. Washable – Yes. This can be cleaned washed in the washing machine and is a great advantage with messy kids. Color – Comes in pink and a few other girly colors. This is a mid-range product and in comparison, this has an all the comfort you’d expect with a touch of feminine class. 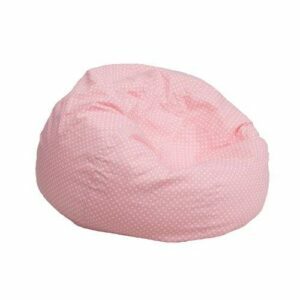 This pink padding is really soft and bouncy, making any room it sits in bright and fabulous. Material – The inside material is polystyrene and is bouncy bean filling. Dimensions – 24 x 24 x 22 Inches and is smaller than most in this review, but is similar to the Disney reviewed earlier. Capacity – 1 to 2 kids huddled up, but one super-snug. Safety – Designed for 2-6 years. The double locking feature makes the zipper able to secure the inside filling. The “Chill Bag” is the best in my opinion. This pear-shaped water-resistant bean-bag has been made with Fabric that can withstand superior roughing and comes in an array of colors which can suit a wide range of homes and circumstances, which others can’t necessarily do. 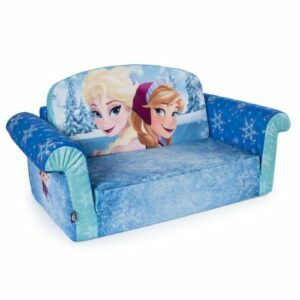 The “Disney Frozen Kids” is the budget choice for and is on the low end of the budget but offers great value for money, which is great. Size – is an important factor when choosing and the larger the child the bigger the bag should be, however you’re probably saying…well of course..but the amount of parents that don’t get the size right first time round would astonish you. Another important factor is, if you want multiple kids to be able to use the bag at the same time, which is preferred by some, especially if a movie is on, then a larger is the one to choose. Color – Make sure to pick the right color and get one that suits the kids, both in personal preference and matches the room. I have never liked orange and red together for example…but maybe that’s just me!! Washable – Some come with removable covers and this makes it really easy to wash, so depending on the way you envision your child using the bag, it’s probably sensible just to make sure you buy the one that suits. My personal preference is always washable, because as we all know a spill can happen at any moment. Some are water-resistant and this is a nice feature to prevent major mess or spills, which can get soaked up. Safety – Most have been made with safety regulations in mind, however there are some that offer greater fire-resistant beads that lessen the chance of fire in the unlikely event. There is another level of prevention and the double-stitched lining and zipper makes it hard to tare, rip or spill.